The National World War II Museum chronicles the story of the American GI through artifacts, personal tales, and cutting-edge technology. Opened on June 6, 2000, on the 56th anniversary of the D-Day landings, the National D-Day Museum, as it was then known, initially focused on the amphibious invasion of Normandy. The choice of New Orleans was an unusual one, since the city’s other tourism sites and attractions are not usually associated with the 20th century or World War II. The Big Easy, known for its food, music, and nightlife, does have a connection to American military history, but most would probably think of it as the site of the Battle of New Orleans in 1814 and as the first major Union-occupied Southern city in the Civil War. In fact, there is a strong New Orleans link to World War II, and notably the Normandy invasion. The Higgins boat, which was vital to the D-Day operations, was designed, built, and tested in New Orleans by Higgins Industries—a crucial reason in determining a site for the National D-Day Museum. Moreover, New Orleans was the home of noted historian Stephen Ambrose, who had spearheaded efforts to see the museum built. With such ties, and the fact that the United States had no official World War II Museum, New Orleans seemed an ideal spot. Located in the central business district, the now-renamed National World War II Museum focuses on the sacrifices and contributions made by the United States during the war. While the original emphasis was specifically on the D-Day landings and the Battle of Normandy, it was clear from the beginning that the museum would not be limited to just one event in the greater war. Instead, the museum’s central focus was expanded to cover America’s role in World War II, both at home and abroad. D-Days in the Pacific exhibits explore the landings at Iwo Jima, Guadalcanal, Tarawa, and other island-hopping battles in the Pacific Theater. In 2003, the museum was designated by Congress as “America’s National World War II Museum,” with a mission statement to address the entire American experience in World War II and a lasting affiliation with the Smithsonian Institution. But first the museum would have to overcome tragedy. As with much of New Orleans, the museum was affected by Hurricane Katrina, which ravaged the city in the fall of 2005. As a result, the museum was closed for more than two months, finally reopening on December 3. When the museum reopened, it proudly proclaimed, “We Have Returned,” evoking General Douglas MacArthur’s famous vow and eventual return to the Philippines. Visitors entering the main atrium of the museum will immediately feel as if they have landed in another time. While museum planners opted not to utilize an existing older structure, as is common with many European military museums, the artifacts inside are akin to a time machine. Visitors are treated to the museum’s current collection of World War II-era vehicles, including a U.S. Army jeep and half-track. Hanging from the ceiling are several aircraft, including a Supermarine Spitfire, Messerschmitt Bf 109, and Douglas C-47 Skytrain, the latter being the main transport aircraft used to deliver American paratroopers to Normandy on D-Day. 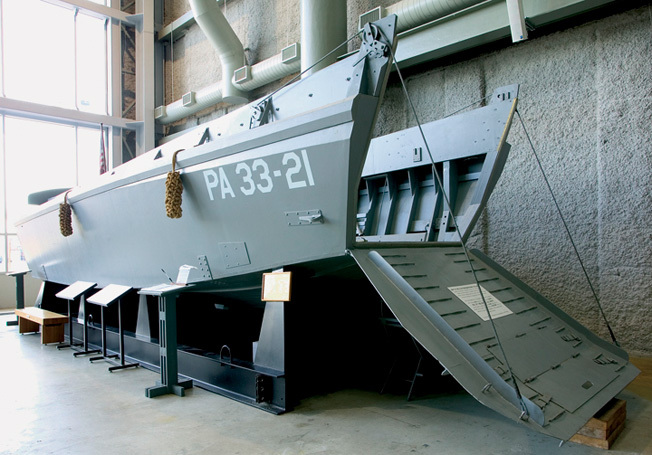 The main attraction in the Louisiana Memorial Pavilion is the museum’s reproduction of the LCVP (Landing Craft Vehicle Personnel), or Higgins boat. It was this boat, built in New Orleans, that carried thousands of Allied soldiers to the beaches of Normandy on June 6, 1944. The museum’s full-scale replica was built using original World War II plans. More than 100 volunteers, including former employees of A.J. Higgins, Inc., the New Orleans shipbuilding company, helped recreate the craft. No less a personage than General Dwight D. Eisenhower, the supreme Allied commander, credited the Higgins boat with helping win the war for the Allies. Without the versatile and hardy boat, the landings at Normandy likely would not have been successful. 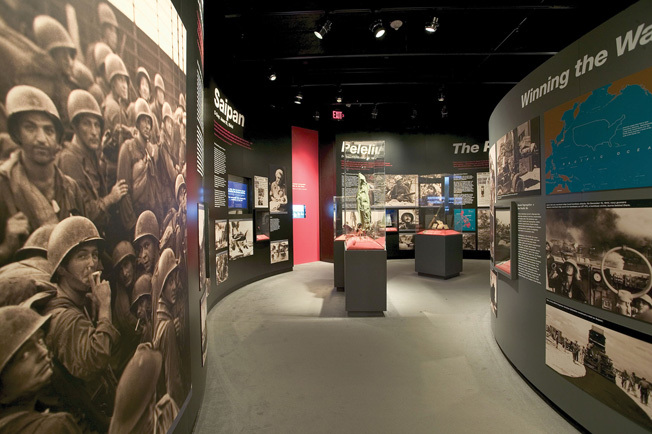 Within the museum are galleries devoted to various aspects of World War II. These include the major military campaigns as well as the American home front. Unlike many other military museums around the world, what makes the National World War II Museum collection really stand out is that many of the artifacts are tied to specific individuals, thus offering a very personal viewing experience. As with many museums, only a fraction of the total collection and holdings are on display at any given time. They are rotated on a regular basis to ensure that repeat visitors will always find something different. “The museum is only able to permanently display a small percentage of its holdings,” says Toni Kaiser, assistant director of collections and exhibits. “It is not uncommon for museums to have large amounts of artifacts and paper material in storage.” Kaiser says that some artifacts were simply too fragile to be displayed or were better used for research purposes. 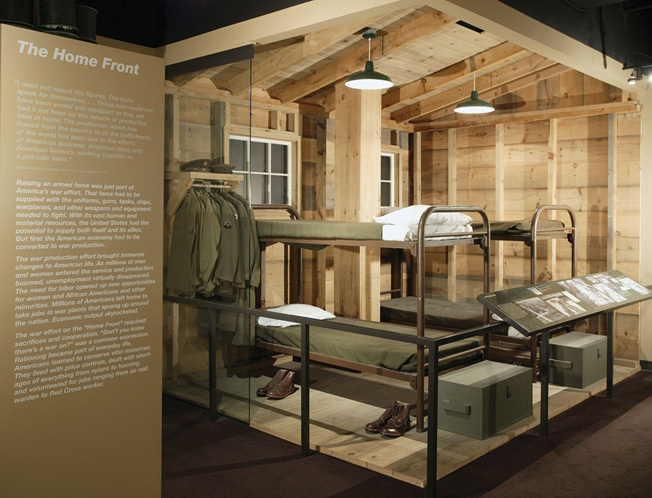 The Home Front exhibit includes a re-created basic training barracks. Another area where the museum is unique is the collection of items from all branches of the armed services, as well as from all ranks, thus making it truly the story of the American GI and his personal experience in World War II. Kaiser says this has been part of the museum’s mission statement and goals since before it opened to the public. “We are not a museum with just the collections of generals and admirals, but more so a museum that tells the story of the average person who served in the military and on the home front,” notes Kaiser. Because there are so many displays tied to individual soldiers, it might be difficult for visitors to take in everything during a single visit. The museum staff recommends that visitors plan on setting aside at least two to three hours. With so much to see, a full day’s initial visit and regular returns are advisable. From American uniforms to German small arms and Japanese propaganda, the museum has much to offer. The displays allow for a close look at the personal artifacts, while ensuring that the items will be preserved so future generations will appreciate the sacrifices of the aptly named Greatest Generation. Likewise, the rotating exhibits show that while World War II ensured the nation’s freedom, the fight must continue. A recent rotating exhibit focused on artifacts from New York City’s Ground Zero and the site of the World Trade Center. The museum is charged not only with preserving the history of the GI but also looking at ways to enhance its presentation of the war. In addition to its artifacts, the museum makes efforts to connect visitors to the past in several ways. These include two restaurants, the upscale American Sector and the simple but quaint Soda Shop, the last blurring the line from the 1940s to the 1950s while still presenting a trip back in time. Noted New Orleans-based chef John Besh operates both restaurants and ensures that they have just enough authentic New Orleans flavor. 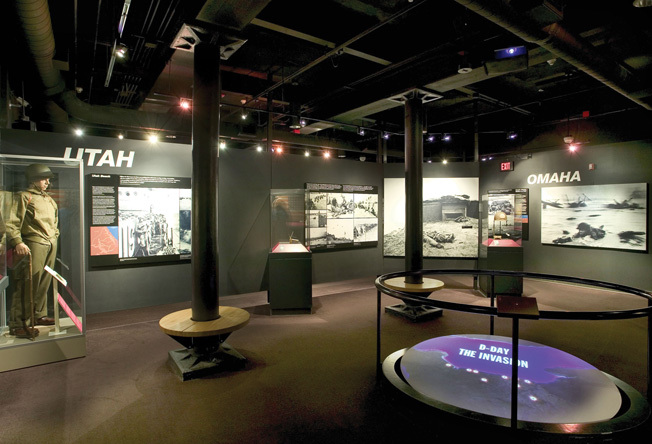 At the museum, modern technology is also used to bring the past to life, including multimedia displays, dozens of oral histories, and short films. And there is also the epic 4-D film Beyond All Boundaries, narrated by Saving Private Ryan star Tom Hanks. The film incorporates vintage black-and-white footage with full-scale props ranging from a 1940s-era radio to the nose section of a B-17 bomber to help transport visitors back in time. In addition to Hanks’s moving narration, the exclusive production for the museum features numerous Hollywood stars, including those who played characters on the popular HBO World War II series Band of Brothers and The Pacific. 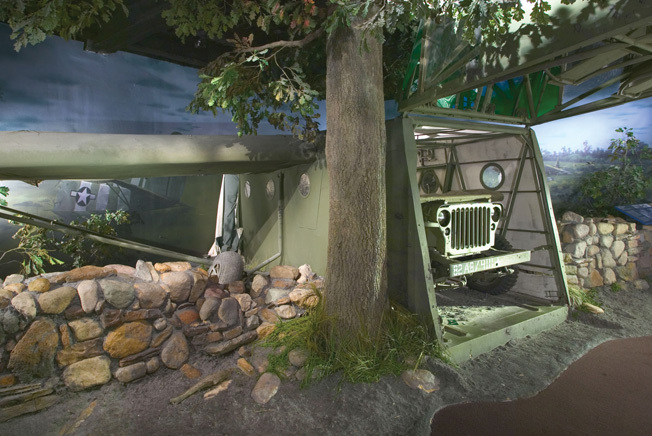 The 4-D technique further engages the audience with life-size props, extensive animation, atmospherics, and even a tactile feedback system that allows the viewer to feel the rumbling of tanks while snow falls during sequences recreating the wintry Battle of the Bulge in December 1944. A wrecked glider in the fields of Normandy represents a dangerous and little-known aspect of the D-Day invasion. The Victory Theater, which presents the film, is just one part of a $300 million expansion project that will continue through 2015. Future expansion plans include a gallery that focuses on the prelude to the war, an overview of the events that led up to World War II. The new U.S. Freedom Pavilion will include more vintage aircraft, tanks, personnel carriers, and other pieces of large equipment, while other galleries will tell the story of the road to Berlin and road to Tokyo, depicting pivotal sea and air battles, and a Guadalcanal gallery that will illustrate the Pacific island-hopping campaigns, along with galleries for the desert war and the campaign in Italy. The Liberation Pavilion will highlight the cost of the war with a closer look at the concentration camps. An Anne Frank exhibit is also planned. For those interested in preserving history, the museum plans to allow visitors a closer view in the Restoration Pavilion, where the restoration and perseveration efforts can be seen firsthand. Already, the first item to call the space home is being restored: a Higgins Industries PT Boat that served in the Mediterranean during World War II. Normandy exhibits focus on both the logistics of the D-Day invasion and the personal stories of those who took part. As with any museum, there is always a want list of specific items. “The National World War II Museum is growing,” says Kaiser. “As part of our new ongoing capital expansion, we are looking for some specific items.” Sought-after items include a Model 50 Reising machine gun, a Liberator pistol, and the dream item—an M8 armored car. Hard-to-find artifacts that make it into the National World War II Museum will surely receive a place of honor as the ever-growing center looks to honor all those who did their part in World War II. Museum admission is $18 for adults, $14 for seniors between the ages of 65 and 80, and $9 for seniors 80 and up, students with ID, and military with ID. Museum members, military in uniform, World War II veterans, and children under five are admitted free. Tags Allies, Axis, D-Day, Douglas C-47, Dwight D. Eisenhower, European Theater, General Douglas MacArthur, Higgins Boat, Messerschmitt Me-109, museum, National World War II Museum, Normandy, Pacific Theater, Supermarine Spitfire.